Photogrammetry techniques become easier, faster and cheaper now due to technological developments for mapping , . Development in digital technology has increased the reliability of the data captured by the camera and used to be the actual data. 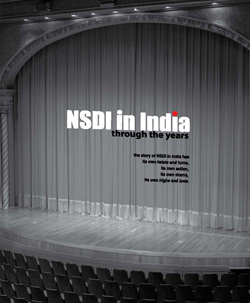 Mapping using non-matrix camera had become renowned due to much cheaper in cost and time efficient. Other study are focusing on low cost mapping system, even though the Unmanned Aerial Vehicle (UAV) was capable in producing digital orthophoto, digital terrain model (DTM) and digital map , , , , , . The mapping accuracy will be depend on type of lens used in the camera, flight altitude, image resolution, digital camera format, etc. 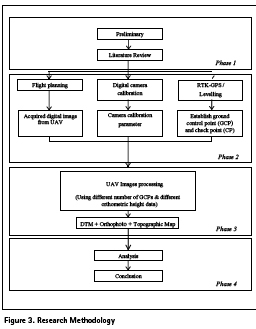 This study focuses on the accuracy assessment of digital camera of different flying height using unmanned aerial vehicle for production of topographic map. The accuracy is assessed by comparing the UAV images’ coordinates with ground control point (GCP) with known values. The ground truth coordinate of GCP were acquired using GPS technique by method real time kinematic (RTKGPS). Levelling were carried out to transfer height from the existing bench mark (BM). The final product of this study is to produce topographic map and to compare the effectiveness UAV in producing topographic map compared to conventional surveying method. In this study, high resolution digital camera are used in capturing high resolution image using UAV as a platform. The study area is Universiti Teknologi Malaysia (UTM), Johor Bahru, Malaysia. The study area is Universiti Teknologi Malaysia (UTM) main campus which is situated at Johor Bahru, Malaysia with an area of 3000 acres. Several ground control point (GCP) and check point (CP) were established around the campus area which comprised of 3D coordinates using GPS observation (RTK-GPS method). The GCP is used in digital image processing such as Agisoft Photoscan to produce photogrammetric output such as orthophoto, digital elevation model, contour line and 3D model. Meanwhile the CP is used for accuracy assessment. UAV is attach together with high resolution digital camera to capture digital images with high resolution to produce digital orthophoto. 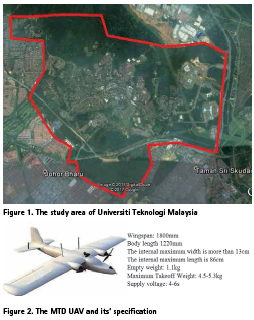 Figure 1 shows the study area indicated by red polygon that covered whole area of Universiti Teknologi Malaysia (UTM). Data acquisition on field is entirely acquired from fixed-wing unmanned aerial vehicle (UAV) with specification of employed autopilot known as the MTD UAV. The UAV is fitted out with the current and advanced technologies such as onboard GPS, fiber optics gyro, autopilot chipset, wireless antenna, electronic speed controller, camera mount, high resolution digital camera, high end transmitter and inertial navigation system. The endurance of this UAV is approximately 2 hours and weight is 4.5kg. Figure 2 depicts the MTD UAV (fixed wing) used for data acquisition for the study area. Together with its’ specification. This study consist of four phases which are preparation of study, the literature review, collecting data, data processing, and data analysis which are shown in Figure 3. The literature review briefly explanation of photogrammetry and the UAV development in numerous applications and mapping purposes. The preparation of study elaborate on the instrument used, flight planning and camera calibration as the technical part in execute the fieldwork. The camera calibration is carried out in the laboratory following the standard procedure to recover the camera calibration parameter . In data collection phase, there are two main data to be collected on field which are ground control point (GCP) and check point (CP) that were established using GPS technique RTK-GPS. Another data are camera calibration and digital images captured by UAV at the study area. The determination of GCP and CP location must be well organized and enclosed the study area. In the processing phase, all the UAV digital images were processed using Agisoft Photoscan software to produce high resolution orthophoto, digital terrain model (DTM), 3D point cloud and texture. The GCP is used in the data processing stage. In this study, the output were successfully produced. In the analysis phase, the orthophoto is then analyzed by comparing the CP on the image with the actual CP on the ground observed using GPS technique to determine the planimetric accuracy by checking the value of root mean square error (RMSE). For the vertical accuracy, the height coordinates of the CP is compared with the value obtained from the DEM for the corresponding CP. Similarly the RMSE is used to determine the accuracy of vertical coordinate. 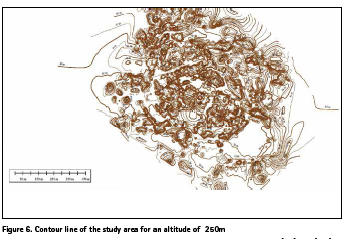 The results obtained from this study include orthophoto of UTM campus, DTM and contour line. The UAV was flown at three altitudes of 250 meters, 300 meters and 350 meters using a digital camera. In this study, the MTD UAV was flown over small area of the study area as shown by the yellow polygon in Figure 1. The rest of the study area will be flown at other time to complete the mission of flying for the whole area which will be divided into several segments. After all the UAV digital images were acquired, it is processed for the three different altitudes using the Agisoft Photoscan software and utilizing the GCP in the study area. Orthophoto Figure 4.1 to 4.3 show the orthophoto mosaic for the altitudes of 250 meters, 300 meters and 350 meters respectively. The figures show that as the altitude increases, the coverage also increases and at the same time the number of UAV digital images decreases. Figures 5. 1 to 5.3 show the Digital Terrain Model (DTM) for the altitudes of 250 meters, 300 meters and 350 meters respectively of the study area. Similar to the orthophoto mosaic, the area of DTM increases as the altitude of UAV increases. In general, the pattern of DTM is the same where the red colour indicates the highest part of the study area while the blue colour indicates low area. Agisoft Photoscan software is capable to produce DTM and 3D point cloud. To generate contour lines, the DTM is exported into Global Mapper 8 software. The contour line is generated for each altitude. Figure 6 depicts an example of contour line at 2meter interval for an altitude of 250m meter. The digitization process is done on orthophoto mosaics to generate topographic map. 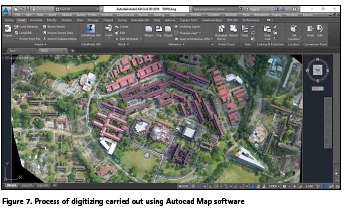 The orthophoto is exported to Autocad Map software for the process of digitizing as shown in Figure 7. In this study the orthophoto generated from an altitude of 250m, 300m and 350m was digitized to produce the topographic map. In this study, the fixed-wing MTD UAV was successfully flown at three altitudes for data acquisition of the study area of the yellow polygon shown in Figure 1. The flight mission does not take long time to complete it. The process of establishing the GCP and CP using the GPS technique take some time. The UAV digital images processing took the longest time compared to other stages. However, all the photogrammetric output such as orthophoto, DTM, 3D model and point cloud were successfully produced. For the accuracy assessment, it was found that accurate results of orthophoto dan DTM were produced at sub-meter level of ± 0.05 meter for planimetry and ± 0.30 for height. The topographic map was also successfully produced based on the UAV digital images. This topographic map can be produced at short time and accurate compare to conventional aerial photogrammetric technique. In this study, the low cost UAV system was employed and the final output was successfully produced. This system is very applicable for topographic mapping especially for small area compared to conventional aerial photogrammetry in producing topographic map. Also the flight mission can be done at cloud free day, flying under the cloud, save time and economical. We are deeply grateful to Ministry of Higher Education Malaysia (MOHE) for funding this project under Research University Grant Vote No: Q.J130000.2527.16H05. Million thanks also for people who directly or indirectly involved by sharing ideas and provide technical support, throughout this study. Hamid A 1990 Asas Fotogrametri. Fakulti Kejuruteraan dan Sains Geoinformasi, Unit Penerbitan Akademik Universiti Teknologi, Malaysia. Ahmad A 2011 Digital Mapping Using Low Altitude UAV. Pertanika Journal of Science & Technology, 19. Ahmad A 2012 Large scale mapping using digital aerial imagery of unmanned aerial vehicle. International Journal of Scientific & Engineering Research, 3(11). Rahman A R1994 Model Rupabumi Berdigit. Jabatan Geoinformatik, Fakulti Kejuruteraan & Sains Geoinformasi, UTM. Arjomandi M, Agostino S, Mammone M, Nelson M, & Zhou T 2007. Classification of Unmanned Aerial Vehicles. The University of Adelaide. Bendea H, Chiabrando F, Giulio Tonolo F and Marenchino D 2007. Mapping of archaeological areas using a low-cost UAV. The Augusta Bagiennorum test site. In XXI International CIPA Symposium (pp. 01-06). Chandler J 1999 Effective application of automated digital photogrammetry for geomorphological research. Earth Surface Processes and Landforms, 24(1), 51-63. Chiabrando, Filiberto, Roberto Chiabrando, Dario Piatti, and Fulvio Rinaudo (2009) “Sensors for 3D imaging: metric evaluation and calibration of a CCD/CMOS time-of-flight camera.” Sensors 9, no. 12 (2009): 10080-10096. Colomina I, Blázquez M, Molina, P, Parés, M E and Wis M 2008 Towards a new paradigm for high-resolution low-cost photogrammetry and remote sensing. IAPRS&SIS, Vol. 37(B1), Beijing, China, pp. 1201-1206.
 Cooper M A R and Robson S 1996. “Theory of Close Range Photogrammetry”, Atkinson, K.B., Close Range Photogrammetry and Machine Vision, ISBN 1-870325-46- X, Whittles Publishing, Scotland. Cui H X, Lin Z J and Sun J 2005 Research on UAV remote sensing system. Bulletin of Surveying and Mapping, 5, 11-14. D’Oleire-Oltmanns S, Marzolff I, Peter, K D and Ries J B 2012 Unmanned Aerial Vehicle (UAV) for monitoring soil erosion in Morocco. Remote Sensing,4(11), 3390-3416. Eisenbeiss H 2004 A mini unmanned aerial vehicle (UAV): system overview and image acquisition. International Archives of Photogrammetry. Remote Sensing and Spatial Information Sciences, 36(5/W1). 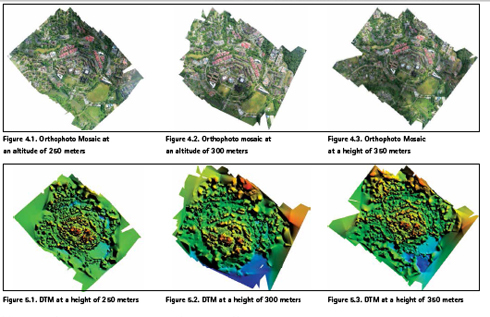 Everaerts J 2008 The use of unmanned aerial vehicles (UAVs) for remote sensing and mapping. The International Archives of the Photogrammetry, Remote Sensing and Spatial Information Sciences, 37, 1187-1192. .
 Abdul Rahman F (2006). Analisa terhadap rekabentuk bingkai kalibrasi bagi kamera digital untuk fotogrametri jarak dekat (Doctoral dissertation, Universiti Teknologi Malaysia, Faculty of Geoinformation Science and Engineering; Department of Geomatic Engineering). The paper was published in IOP Conference Series Earth and Env. Sc. Vol 169, Conference 1.